Diverse Futures is a project initiated by Diverse City. We are advocates for diversity in the Performing Arts. 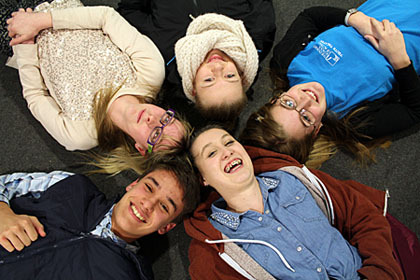 We work with inclusive groups of young people, communities and professional artists. Activate Performing Arts. Many of the young people from Remix who are disabled are incredibly talented, passionate and creative emerging artists but they couldn't figure out how to continue in the performing arts after finishing school. There is a lack of information out there. As a result many are signposted to the social sciences, or general courses in life skills. They are rarely told about professional integrated performing arts provision. We knew this needed to change. Together with our partners Activate Performing Arts and The Esmée Fairbairn Foundation we set out to create Diverse Futures. Our mission was to build an online map as a tool for young people, (as well as their parents/carers, friends and career advisors) and gather new intelligence on what provision there is for young people who are disabled who want to progress in the professional performing arts industry. Our small but expert team included Emma McFarland as our Research & Mapping Lead who has worked incredibly hard to gather and present all of this information, Ted Giles as our Web Developer who has designed the site, Alice Chutter as Producer to pull everything together and to oversee the whole process. Claire Hodgson, Chief Executive of Diverse City, had the original idea and initiated this project. Diverse Futures is a place to share what we have discovered. We hope that this will help to inspire, educate and develop emerging artists from across the UK and serve as a starting point to mapping out your future plans. In 2015 Diverse Futures won the European Diversity Award Community Project of the Year. Read more[PDF]. The copyright of images and information contained within the diversefutures.org.uk domain is owned by Diverse City. Gathering this information wasn't easy and although we've worked jolly hard we do not claim to be experts or that this is an exhaustive list. We have worked with passion to get the information out there and in the public domain. We created Diverse Futures because another resource like this doesn't exist (to our knowledge!). If you think we've missed something that should go on our map please let us know. To help us keep the site current we need support in the form of donators and benefactors. We'd love to hear from you as we continue to develop and evolve the site. Please contact us on info@diversefutures.org.uk.